He played first base, second base, third base, catcher, and the outfield in the major leagues, but 558 of his 568 games in the field were behind the plate. Red Kleinow hit for a .213 average, playing at a time that any contribution at all from a catcher was considered a bonus. He was born in Milwaukee as John Peter Kleinow on July 20, 1877, his father Johann and his mother Regina both immigrants from Germany. Johann Kleinow was a saloon keeper and must have done well enough; he was listed in the census as a coal merchant in 1900. By 1910 Regina is listed alone (Johann is presumably deceased) and she was able to list “own income” as her source of money. There were four children in the household. Two younger brothers – Robert and George both labored at Harvester Works, part of International Harvester. The youngest, their sister Teckla, did housework. John was already a well-established ballplayer, and had attended St. Edward’s University. John had first played in the Milwaukee City League, but his professional baseball career began in 1900 for the Fort Wayne Indians, where he played for about 10 days before being shuffled off to the Saginaw Salt Eaters. After about two months in Saginaw, hitting .345 in 49 games, Kleinow returned to Fort Wayne where he’s recorded as hitting .329 in 29 games with the two stints combined. Fort Wayne was in the Interstate League, a Class B circuit. 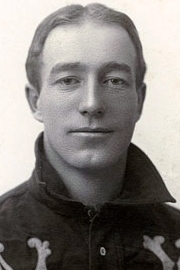 In 1901, Kleinow climbed the ladder a notch to Class A, and put in a season in the Western League where he played for two teams: the Des Moines Hawkeyes and the Minneapolis Millers. Records are incomplete. Independent baseball was his home for 1902, another season split between two teams: the Oakland Clamdiggers of the California League (29 games) and the Toledo Mud Hens of the American Association, for 116 games – hitting .294 with Toledo. He stick with the Mud Hens in 1903, batting .320 for a team that was back in Organized Baseball, as the American Association became a Class A league. After the season, the Cincinnati Reds put in a claim for Kleinow’s services, only to be told that Clark Griffith’s New York Highlanders had already dealt for him – but Kleinow’s name was not on New York’s reserve list, so Cincinnati smelled a rat and pressed the point. Three days later, however, Cincinnati’s Gerry Herrmann, acting in his role as chairman of the National Commission, in effect ruled against himself, deciding it had been an oversight on New York’s part and so let the catcher go to the Highlanders. Toledo received four players in the trade. The next spring, Griffith told reporters, “If I am a good judge of material we have a jewel in Kleinow.” The young catcher first got his feet wet on May 3, 1904, coming in to a game in New York when the Highlanders had built up a 6-0 lead and he took over for Jim “Deacon” McGuire. Kleinow doubled in his only at-bat. For the remainder of the season, Kleinow was the frequently used backup to the 40-year-old McGuire. The 1904 American League season went right down to the wire, with the reigning champion Boston Americans taken to the final day by the Highlanders. New York had to take both games of an October 10 doubleheader to win the pennant. In the first game Griffith pitched 41-game winner Jack Chesbro, with Kleinow catching. Kleinow had a 2-for-3 day at the plate, scoring the first run as New York took a 2-0 lead. Boston tied it in with a pair in the top of the seventh, then took the lead that won the pennant on a single, a sacrifice, a fielder’s choice, and Chesbro’s wild pitch. In his first year in the big leagues, Kleinow had gotten into 68 games and hit .206, driving in 16 runs. He was said to be one of the few players who received an increase in salary during the offseason. During the offseason, he worked in the coal and wood business in Milwaukee and enjoyed bowling. In 1905, he caught more games than McGuire, hit .221 (including his first home run, on June 10) and drove in 24. He might have played a bit more, but suffered injuries on both May 20 and May 24, and a serious one on July 7 that resulted in him returning to Milwaukee for a couple of weeks. His 1906 was much the same, a .220 average and 31 RBIs, with him having worn down a bit near the end of the campaign. There were reports he traveled to Marienbad, Germany, to take the baths there and recuperate during the winter, but Sporting Life reported that he was home in Milwaukee and that Coney Island was as close as he’d been to Germany. Bad influences may not have been attributable to one man alone. Kleinow’s 1908 was an overall disappointment at the plate, and it started on a couple of odd notes. He spent the offseason in New York and got into a fight with a significantly older reporter, beginning in fun in a New York café. After Jack got knocked to the ground, he roared back and slammed the reporter against a wall and “bit a piece out of the reporter’s cheek.” A couple of weeks later, he still hadn’t turned up for spring training in Hot Springs even though he’d set out seven days earlier for the site. As the season got underway, he was among those who adopted the new chest protector for catchers behind the plate. He missed only one game over the first six weeks of the season, but his hands were still vulnerable and he suffered a badly broken finger on his right hand in the first part of August. He hit only .168, with concomitant drops in run production. In 1909, New York was counting on him to be the mainstay once more, but he only played in about half the games and his catching was said to be not up to its usual standards. His average got back up to .228, improved significantly by one big burst of hitting against the Tigers in late July. His name began to crop up a little more than usual in trade rumors. Manager George Stallings was reported to have proposed a trade with Washington which might have made the Yankees an even stronger team: New York would receive Walter Johnson and Gabby Street, in exchange for Kleinow, Kid Elberfeld, Clyde Engel, and Joe Lake. Washington wisely declined. By virtue of being with the Red Sox, Jack had the opportunity to travel across the country on the team’s ambitious spring training trip of 1911, as the Sox played 64 games that spring while nominally based in Redondo Beach, California. Though Kleinow was an ace at billiards (the “premier wielder of the cue” who “seldom loses a game”), when it came to baseball and the regular season, he seldom appeared in a game. He was used infrequently by the Red Sox (appearing in only eight games over the first 3 ½ months on the schedule) and was eventually sent to the Jersey City club. He didn’t want to accept the demotion, instead starting a dialogue on what it would cost him to buy his freedom - to purchase his own contract back, so he could make a deal of his own. It took him most of the month to find a willing buyer, but on August 29 the Philadelphia Phillies acquired his services. Two weeks later, he was released. He’d appeared in four games, with a double in eight at-bats. They were his last in the majors. On February 1, 1912, Kleinow signed with Jack Dunn’s Baltimore Orioles but appeared in less than 10 games and was released in early June. His 1913 was spent in the Federal League (an outlaw minor league) with the Cleveland Green Sox, signed by manager Cy Young. In December Sporting Life reported that he had been captain of the Indianapolis Hoosiers in the Federal, and was seeking a job as manager in the (now major) league for 1914. No job as skipper was offered, and he played in 20 games in 1914 with the Montgomery Rebels in the Southern Association, his final season as a player. By June, he’d been released and begun working for Montgomery as a scout. In addition to the sources noted in this biography, the author also accessed Kleinow’s player file from the National Baseball Hall of Fame, and consulted Retrosheet.org and Baseball-Reference.com. Los Angeles Times, February 28, 1911. For a full account of that extraordinary trip, see Bill Nowlin, The Great Red Sox Spring Training Tour of 1911 (McFarland & Co., 2011). New York Times, August 6, 1911. An unattributed clipping in Kleinow’s player file at the National Baseball Hall of Fame says that he played independent ball, often for the New York Metropolitans, during weeks of dickering.